Grinding your own beans isn't as much a thing in Paris as it is, say, in Portland, but it is most definitely first priority at La Caféothèque. This multi-room "homey, rustic, classy former-hipser-who-has-kids-and-a-job" café sells a plethora of coffee directly from small producers and serves nearly any well-crafted coffee drink you desire. According to a friend of mine who described it as such, they also serve a great cheesecake. I can only speak to last Wednesday's café du jour in the form of une noisette though... and it was amazing. 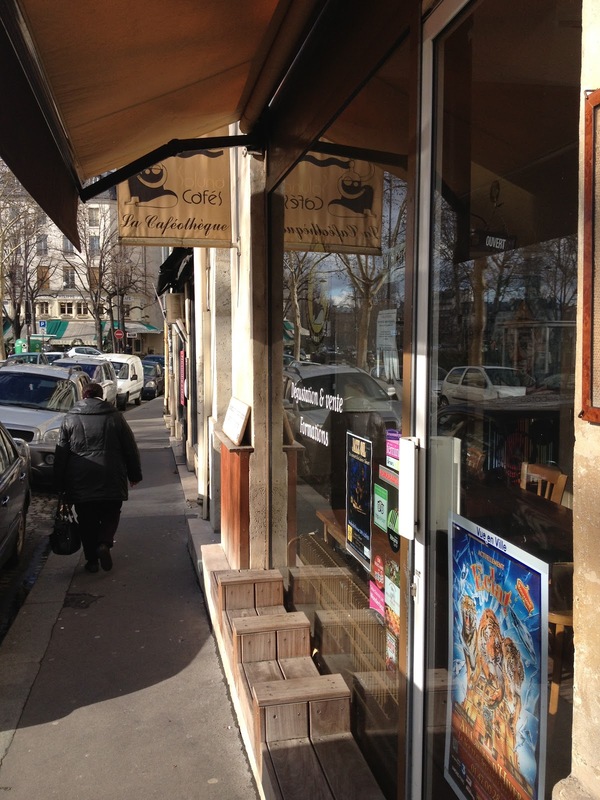 La Caféothèque was the perfect environment to get ahead on schoolwork after spending the morning in central Paris. Though the lack of wi-fi may be a deterrent for some, I actually appreciated the lack of distraction it brings. It made for a very productive two hours; so much so, that I didn't feel the least bit guilty when a first meeting with Anna turned into seemingly endless conversation. She's the coolest, by the way. Onto the next! A few weeks ago, after arriving back, I made plans to catch up with Lara. We met at Opéra (a halfway point between our apartments) and, by chance, wandered up Boulevard Haussmann, into Printemps, and up to the top floor. We were happily surprised to find that not only did Brasserie Printemps serve a delicious cup of coffee in a gorgeous environment, but also did so at a very reasonable price. 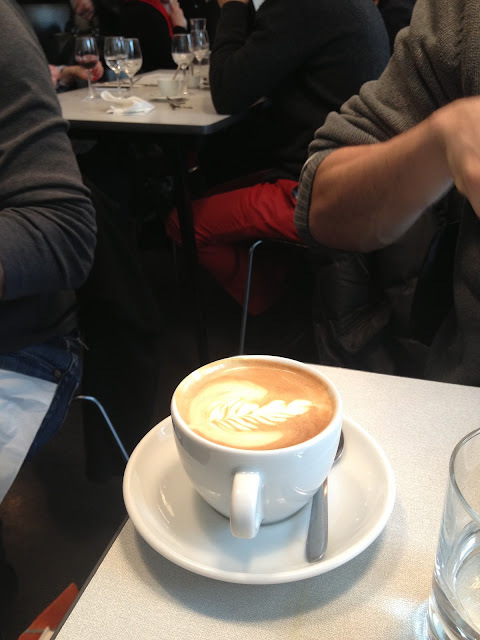 See, that's the thing about good coffee in Paris... it tends to be a bit pricey. The coffee at Coutume Café, for instance, is fantastic, but you pay for such quality and expertise. The same goes for the wonderful KBCafeShop. Even still, I'll admit, I can hardly help but frequent them more than my budget would like. I'm not completely irresponsible though. 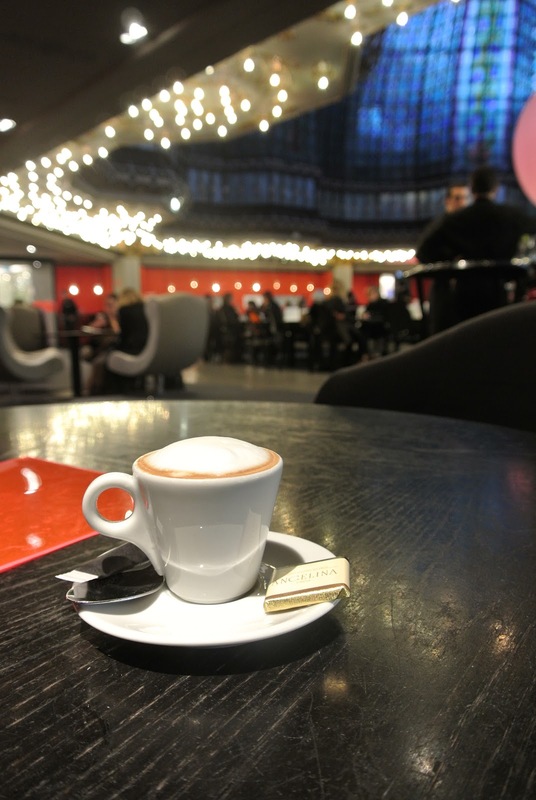 I'm aware, for example, that although the cappuccinos at Le Bal Café are phenomenal, I simply cannot enjoy them often. If I were to try, the rest of my money would most certainly go towards their incredible scones and, on Sundays, fabulous British brunch (see below). Such is life, huh? How lucky we are. Wishing you a great week ahead! Next on my to-sip list: Ten Belles. I'm so happy you enjoyed your visit at La Caféothèque :) And now I'm definitely going to brunch at Le Bal after seeing those photos! Thank you for last time at Angelina as well, I had a great time! Yes, I did! Thank you for pointing me in the right direction. And please let me know when you brunch at Le Bal. I want to be jealous ;) hope to see you again soon! Coffee in Paris is definitely expensive, but you're so lucky to enjoy an exciting coffee scene in it's beginning stages. I completely agree that La Cafotheque is amazing; I was completely shocked at how empty it was when I went! You are going to love Ten Belles. Also, I definitely recommend checking out Telescope, near the Louvre. I went there when I was in Paris and it was another lovely, albeit empty, cafe. Empty = lovely to me. I'll definitely check out Telescope as well. Thanks for the recommendation! Ah! I could have used this when I went to Paris last summer. The coffee was never great at any of the places I visited. However, the pastries were top-notch. And that totally made up for it. Haha, pastries can definitely redeem a mediocre coffee. Oh, wonderful tip :) I've heard good things about Café Lomi, too. It's on my list!